The upcoming second-round series between the Pittsburgh Penguins and the Washington Capitals will be a battle for both teams. Neither club is as strong as it was on paper three years ago, but each still has some formidable weapons and serious motivations. The Capitals are looking for their first Conference Final of the Alex Ovechkin era; the Penguins are eyeing the once-in-a-lifetime opportunity of a three-peat. For the Penguins, though, a couple big question marks hover over the team as they head into this series. Here’s a look at three X-factors for the defending champs. After Evgeni Malkin fell awkwardly to the ice in a collision with a Flyers player in Game 5, he was clearly hurt. Even though he returned for the third period of the game, there was no question he wasn’t at 100 percent. That was confirmed when Malkin, initially announced as a game-time decision— which, under head coach Mike Sullivan, all players generally are— sat out Sunday for Game 6. Even on Tuesday, at the Penguins’ first practice before the second round, Malkin was absent. He is not wearing a cast or a brace, although Josh Yohe of Pittsburgh Post-Gazette reported that Malkin was indeed walking with a limp. Just saw Malkin. No casts or anything. So that’s good news. Walking with a hint of a limp. Whether or not it the injury is serious enough to take Malkin out of some— or all—of the Capitals series is a crucial factor in how great of a chance Penguins will have to make it past the second round. The damages to the lineup in his absence are two-fold. Malkin is, of course, a dominant second-line center and a serious threat to the Capitals’ defense, as well as an important part of a Penguins power play that was historically dominant during the regular season. But even beyond losing an incredibly skilled offensive player, the absence of Malkin causes the Penguins’ often-lauded depth to buckle. In Game 6, Riley Sheahan was moved up to center the second line, leaving Carter Rowney to slot in on the fourth line. And that fourth line of Zach Aston-Reese, Tom Kuhnhackl and Rowney has the potential to get absolutely steamrolled by the Capitals. In Game 6 against the Philadelphia Flyers, the first time that line has shown up in the 2018 playoffs, that trio saw under four minutes of ice time together at even strength. They were eaten alive in possession time with a Corsi-for percentage of only 16 percent according to Natural Stat Trick, allowing five shots against to one shot for while on the ice. The low ice time Sullivan gave that line shows that without Sheahan, he’s not willing to depend on the fourth line to carry play. 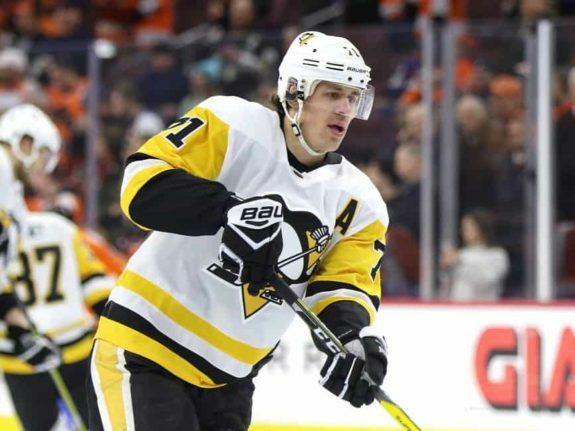 Malkin’s absence exposes severe weaknesses in the offensive depth of the Penguins’ roster, and the Capitals, especially with home ice to start and potentially finish the series, have the opportunity to take advantage of it. Matt Murray’s .911 save percentage over the first round of the 2018 playoffs is a bit of a deceptive number. He put up two perfect performances in Game 1 and Game 4. But his other numbers weren’t quite as impressive— for three of the six games in the first round, Murray had a save percentage of below .900. In each of those three sub-.900 performances, he allowed at least three goals against. Save percentages will never tell the whole story of a goaltender’s performance. But in some of those games, Murray looked shaky. In Game 6, for example, the goal the Flyers scored to go up 4-2 in the second period was a bad one, with no screen and with the shooter far enough away from the goal that Murray usually would have been able to make the block. After this goal, Casey DeSmith, the Penguins’ backup goaltender, left the bench and started stretching in the hallway. It looked like Murray was in danger of being pulled for the first time in the 2018 playoffs. 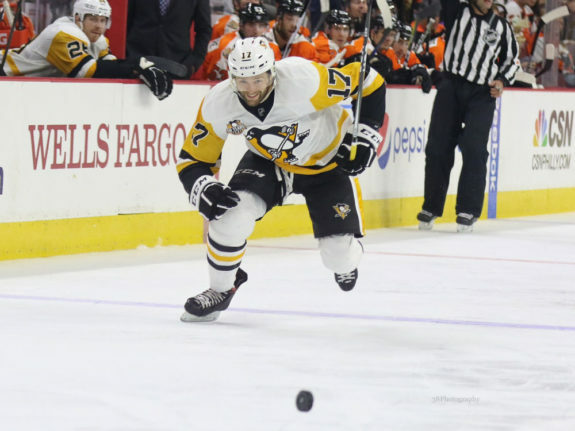 But that particular debate was put to rest when Patric Hornqvist scored just over a minute after the Flyers’ goal, cutting the home team’s lead to 4-3. DeSmith put his baseball cap back on and went to sit on the bench, and Murray would only face five more shots from the Flyers in the third period, letting in one goal but taking the win anyway as Jake Guentzel racked up four goals to finish off the game. 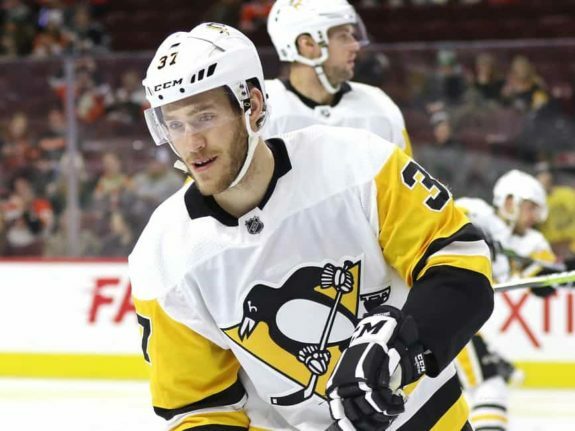 Even though Murray didn’t actually leave the game, the episode raised the question of what the Penguins will do if Murray does get pulled— and how much they really think they can depend on rookie backup DeSmith, who has only started 11 games in his NHL career. Unlike 2016 and 2017, the Penguins don’t have a reliable second option if Murray falters. Murray has proven himself to be a championship-worthy goaltender. But if he struggles now, the Penguins, unlike last year, will find themselves without another option. The two sides of Penguins’ special teams could not have looked more different in the first round. The Penguins’ penalty kill was the best they’ve been all year, while the power play was surprisingly lackluster. The power play only averaged more than one shot per opportunity in one out of the six games and finished the series with a 20-percent conversion rate while allowing one short-handed goal. That’s not bad, but it’s certainly less effective than the Penguins’ usual rate: since Jan. 1 to the start of the postseason, the Penguins were converting at a rate of almost 28%. Part of the trouble may have been due to injuries; the power play was missing Hornqvist or Malkin for half of the series. But it was the fundamentals that were killing the Penguins’ first unit, which often struggled to get zone time on the man advantage. Just look at the team’s single power play in Game 6 for an example of the struggles that plagued the unit throughout the series: on the two-minute power play, the Penguins got off one shot, and it was from behind the goal line. That’s a familiar story from a power-play unit that often spent an entire opportunity chasing the puck without ever actually getting set up in the offensive zone. The penalty kill, on the other hand, has been excellent. The Penguins successfully killed off 90 percent of the penalties they accrued during the Flyers series. The question, then, will be whether this is because the Penguins’ penalty kill is fundamentally strong or because the Flyers’ power play was just remarkably weak. Going up against the Capitals’ power play, which decimated the Columbus Blue Jackets’ kill in the first round, will be a huge factor in the Penguins finding success in this series. The Penguins will look for more spark on the power play and the same energy on their penalty kill as they square up to face down the Capitals for the third time in three years.